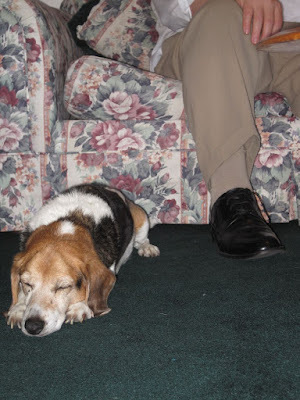 Since last week I talked about Malcolm, this week, and for my final NaBloPoMo post, I'll talk about the rest of my family pets over the years. Caramel - I got Caramel the hamster for my third birthday. I don't know how long he was with us, but he was fun while he was around. I enjoyed letting him run around in his little hamster ball. I'm sure I wasn't the best hamster owner and my parents did a lot, but I liked him. Sadly, he got into some rat poison at some point and we had to part ways. We buried him behind the house. I tried digging for him once. It's probably for the best it didn't work. A series of goldfish - At some point, maybe I was around 9?, we kids each got a goldfish. Mine was Crystal Light, after the goldfish in the Babysitter's Club Little Sister books, and eventually I had Crystal Light the Second. Goldfish are not the most interactive pets, but I liked mine. 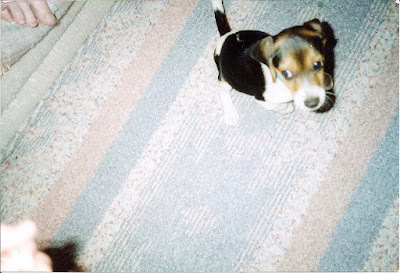 I had Frank in my late teens, but I was terrible at taking care of him, especially remembering to clean his bowl. 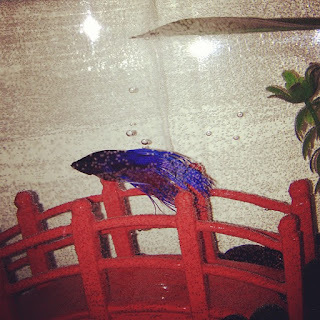 He lived for a lot longer than I anticipated, but my family still forgot to tell me for awhile when he died while I was on study abroad in London. Logan - I've talked about Logan before. We got him as a puppy when I was 13 and he passed away when I was 29. He was a wonderful dog. Sometimes I feel guilty when I call Malcolm the best or cutest or feel like I'm spending more time with Malcolm than I did with Logan, but then I decide that as long as I'm referring to best or cutest living dog, it's okay. As for spending time? We do our best and that's what counts. Betta fish - Blake and I have had two betta fish since we got married - Mortimer and Captain Jack (Harkness, not Sparrow). They each lived with us for about 6 months and they were pretty to look at. We had Malcolm by the time Captain Jack left us, so that's probably it for us and fish for awhile. Anyone need a betta tank? I enjoy having a variety of pets, though the more interactive the better. I think I've done a pretty good job of my animal stewardship in this life. I hope they would say the same! When we call Henry the best boy, it's inferred that we mean the "best boy living," because they're ALL the best boy/girl. :) I'm sure Logan understands, because he was an awesome dog. I miss him too. I have very fond memories of our four legged family members. Not such fond memories of the fish, they aren't really my thing. Every now and then I think I'd like to get a pet for our kids, but with Brett's allergies all the options kind of gross me out.